William Bratton (? 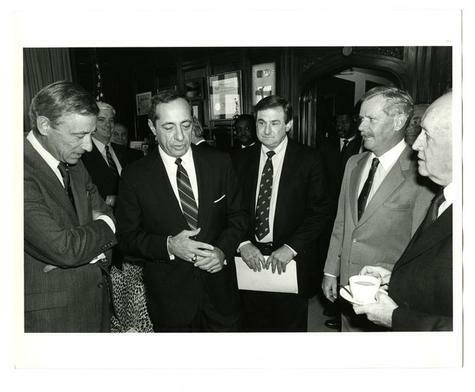 ); NY Governor Mario Cuomo; NY State Director of Criminal Justice, Lawrence T. Kurlander; John Jay College President Gerald Lynch and Commissioner Patrick V. Murphy at the launch of the Crime Prevention Week Initiative. Group discussion in President Lynch's office before the announcement of of Crime Prevention Week Initative at John Jay College.